GTR1400MAN wrote: How about sat a T-junction on an unlit B road waiting to turn and the vehicle is approaching from behind at speed? I'll be seen earlier. So you have a tail-light, retro-reflective number plate, brake light, your headlamp is illuminating the scene ahead and your indicator is flashing. Plus whatever road signs and markings there are. Will a jacket *really* make any difference? GTR1400MAN wrote: Or crossing a RAB with a vehicle coming from the left. etc. Would you rely on chance here? [Also bear in mind you have a sodding great headlamp on the front!] A situation, surely, where if you've identified a potential collision then proactive riding is far more appropriate? If he sees me earlier, he MAY back off earlier, so I need do less proactive riding. The problem is that "sodding great headlamp" is a dull glow worm in the current environment we ride in (and I refuse to join the arms race). Also it is being viewed from the side and it's more about what it is illuminating rather than the size of the source. Again, this is another where some footage may help. Horse wrote: However, if you want to achieve this at night then additional low-power lighting at the fairing extremities might be better. As above I'm still resisting joining the "my lights are bigger / brighter / more off" club. Another complication: do you know about Yahoudi lights? Horse wrote: Another complication: do you know about Yahoudi lights? Same with wearing a white helmet. It can blend in with the sky, rather than stand out. There's no one solution. Well, maybe. Fully dressed in black that reflects in the dark ... or we start looking seriously at the many Tron style suits/accessories where the rider is actually illuminated. Here's my customised Schuberth C3 Pro (Click for bigger pics). Go for any conspicuity scheme you like (want links to a couple that found black to be best, in some circumstances?) - but don't expect it to do any good - there's really no substantial proven benefit. It *might* - but you can't ever predict when, *musr* take appropriate action anyway. Just as a f'rinstance: I started biking in '76. Nobody rode with lights on in daytime - with Brit iron the battery would have died, and my first bike (175cc) had a 25W tungsten dipped beam(!) and almost no-one wore hi-viz. Fast forward to now, with several years of AHO (55W halogen) and many riders wear hi-viz (including helmet). Has there been a meaningful drop in SMIDSYs? On one occasion a group of us were helping marshal a charity cycle ride. We all wore hi-viz waistcoats and bikes were lathered with A3 fluoro signs. A guy pulled out in front of me. Shortly after, he stopped in a bay outside of shops. 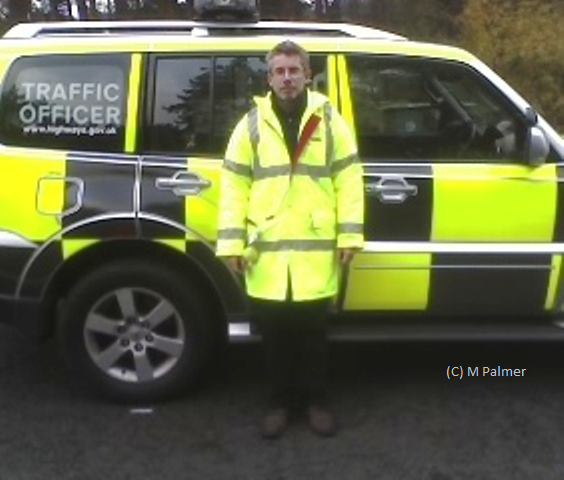 I stopped alongside his open window and said "Go on - tell me you didn't see me"
There maybe no statistical proof that any sort of hi-viz works, but in my own experience wearing it earns me more space from passing motorists. Yes I'm not a motorcyclist but a mere cyclist. The best kind I've found is the reflective 360 stuff - pro-viz stole a march but there are now various others producing similar products. All my cycling is done on outer london (South circular etc) streets during rush hour(s), all year. A study by University of Bath psychological scientist Ian Walker finds that high-visibility clothing is unlikely to prevent the most dangerous passing behavior from drivers. Around 1–2% of overtakes were within 50 cm (about 18 inches) of the rider regardless of what he wore, implying a small proportion of motorists’ passes will always be dangerously close regardless of what a bicyclist wears. “Many people have theories to say that cyclists can make themselves safer if they wear this or that. Our study suggests that, no matter what you wear, it will do nothing to prevent a small minority of people from getting dangerously close when they overtake you,” says Walker. A past study from Walker demonstrated that drivers actually encroached much closer to cyclists wearing helmets than those without one. Drivers perceived helmeted riders as more experienced, and thus assumed they could get closer to them as they passed. The research team wanted to investigate whether a bicyclist’s outfit would influence perceptions of experience, and hence, how close drivers got while passing. A member of the research team, Ian Garrard from Brunel University, used an ultrasonic distance sensor to record how close each vehicle passed during his daily bike commute between Berkshire and outer London (about 50 km round trip). Over several months, data were collected from 5,690 passing vehicles. Seven outfits were tested, ranging from a specialized racing cyclist outfit—implying high experience and skill—to a vest with “novice cyclist” printed on the back, clearly communicating low experience. Counter-illumination is a method of active camouflage seen in marine animals such as firefly squid and midshipman fish, and in military prototypes, producing light to match their backgrounds in both brightness and wavelength. Marine animals of the mesopelagic (mid-water) zone tend to appear dark against the bright water surface when seen from below. They can camouflage themselves, often from predators but also from their prey, by producing light with bioluminescence photophores on their lower surfaces, reducing the contrast of their silhouettes against the background. The light may be produced by the animals themselves, or by symbiotic bacteria, often Aliivibrio fischeri. Counter-illumination differs from countershading, which uses only pigments such asmelanin to reduce the appearance of shadows. It is one of the dominant types of aquatic camouflage, along with transparency and silvering. All three methods make animals in open water resemble their environment. If you stand there like a lemon, it won't work!